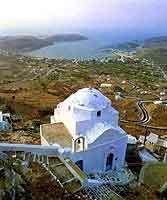 Between Kithnos and Sifnos, Serifos is 73 nautical miles from Piraeus. Bare, undulating hills interspersed with small, fertile valleys cover this picturesque island. The rocky coastline is deeply indented with a succession of coves and bays. The curious rock formations resemble human figures which call to mind the myth of Danae, Perseus and Medusa, as if these prehistoric inhabitants of the island had been turned to stone. The most interesting site of the island, the monastery of Taxiarhes is located on the main mountain, which looks like a castle. 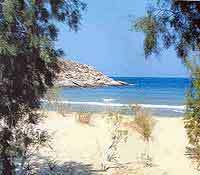 If you're looking for a quiet place, with wonderful beaches, Serifos is the place. Livadhi - You have the choice to anchor in the bay or on the jetty which is located on the South side of the bay. The harbor offers good shelter from the meltemi. Water and fuel are available at the jetty. Most provisioning can be found in the harbor. There are several tavernas in the village and on the waterfront. Ormos Koutala - The bay is located on the South side of Serifos and offers good shelter from the meltemi. Livadi, the sheltered port on the eastern side of the island, where there is a long, horseshoe-shaped sandy beach. Perched on the top of a steep hill, Hora or Serifos, the main town of the island, with its little cube-shaped houses and churches in the island style, with its Venetian castle above, looks like a fairy tale town. The greatest attraction of Serifos is its magnificent beaches, Mega Livadi, Koutalas,Agios Sostis, Psili Amos, Agios Ioannis, Sikamia. Livadi gathers the night life with clubs, bars and summer cinema. You can windsurf in Livadi and Livadakia.